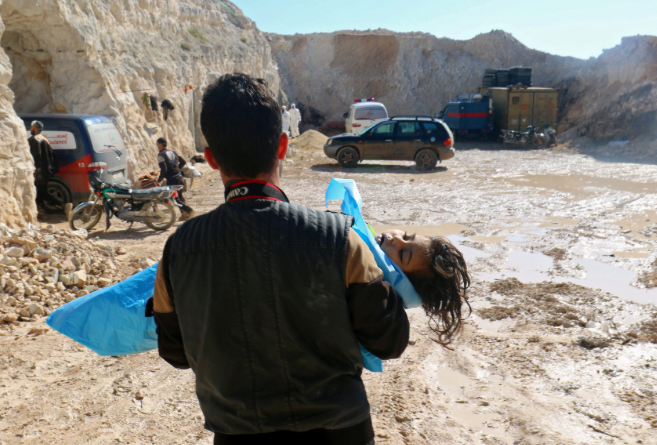 By Rick Sterling – On Tuesday 4 April there were reports of children and other civilians killed by chemical poisoning in the town of Khan Sheikhoun, Syria. There were contradictory reports, some saying they smelled the gas; others claiming it caused immediate death like odorless sarin. On Thursday, 6 April, Trump ordered a ‘targeted military strike’ on Syria with 50 tomahawk missiles attacking the a primary Syrian air base near Homs. This base is used to support the combat with ISIS in eastern Syria and Nusra / Al Qaeda in Idlib province. Accusations that the Syrian government intentionally attacks civilians is contradicted by their policies and actions. As demonstrated last Decembers in Aleppo, civilians are welcomed from opposition areas into government controlled areas. Even Syrian militants are welcomed after they sign an agreement to lay down arms. Western supporters of the armed opposition were quick to blame the Syrian government for the chemical attack in Ghouta on 21 August 2013. However, subsequent investigations by the most credible investigative journalists and researchers concluded the Syrian government was probably NOT responsible. In February 2014, it was announced that a defecting Syrian military photographer, who was anonymous but code named “Caesar”, had 55 thousand photos showing the torture and murder of 11 thousand innocent Syrian civilians. This news received sensational media attention with live interviews on CNN and front page coverage throughout the western world. The news relied on the judgment of legal prosecutors who “verified” the story and produced a “Caesar Report”. This was released the day before the start of Geneva negotiations. It effectively disrupted the talks and facilitated the “rebels” refusal to negotiate and walk away. In reality, the “verification” and report was commissioned by the government of Qatar which has been a major funder of the armed opposition. Since then it has been discovered that nearly half the 55 thousand photos show the opposite of what was claimed: they show dead Syrian soldiers and victims of explosions NOT tortured civilians. That is just one of the findings confirming the fraud involved in this sensational story. A concise expose of “Caesar” is here. – The New York Times feature story on 4 April was “Worst Chemical Attack in Years in Syria; U.S. Blames Assad”. One of the authors, Michael Gordon, was an influential proponent for “weapons of mass destruction in Iraq” that justified the 2003 invasion. But that has apparently not hurt his career. In this story on Syria, he and co-author Anne Barnard claim that “American intelligence agencies concluded” the 2013 attack was carried out by the Syrian government. That is false. The intelligence agencies did NOT agree and the “assessment” came from the White House not the intelligence agencies. It is astounding that they either do not know this or they are intentionally misleading the public. Veteran Intelligence Professionals for Sanity explained the significance in their memorandum “A Call for Syria – Sarin Proof”. – DemocracyNow is a popular television/radio show. It is widely considered to be “progressive” but is also highly biased in its presentation on Syria. It almost solely promotes the perspective of those who support the armed opposition and/or western intervention in Syria. On April 5, they interviewed Dr. Rola Hallam. She is infamous for being the key player in the documentary “Saving Syria’s Children” which purports to show a chemical weapon attack in Aleppo but was actually staged. The “documentary” was then broadcast at a critical time trying to influence the 2013 vote in British parliament for an attack on Syria. On April 6, DemocracyNow interviewed another “Syrian” who lives in the West and promotes western intervention: Lina Sergie Attar. Viewers of Democracy Now have no idea that the majority of Syrians support the government and especially the national Army in their struggle against invasion and terrorism. Some of the world’s most famed political analysts have contributed to the confusion and lack of resistance as the war on Syria has continued. For example, Noam Chomsky on Democracy two days ago said “The Assad regime is a moral disgrace, the Russians with them.” Evidently he believes all or most of the accusations which have said about the ‘regime’. In sharp contrast with Chomsky’s assessment, it’s remarkable that Syria has held together as well as it has in the face of attack by some of the most powerful and rich countries on earth. Over 100 thousand Syrians have given their lives defending their country against the onslaught. Russia has supported their ally in compliance with international law, continually trying to work with the U.S. coalition as a “partner” against terrorism. Evidently Chomsky is unaware or does not believe the extent of lies that have been created around Syria. Evidently he does not recognize the distorted and shameful media coverage mentioned by Kinzer. Everyone makes mistakes but Chomsky’s poor analysis here is a whopper. If he was to visit Syria and talk with real Syrians I think his perception would be dramatically changed just as described by the PBS Frontline crew here. With consummate hypocrisy, both Syrian and Russian governments are now demonized by western neoconservatives and liberals who have done little or nothing to stop their own government’s collusion with terrorists raining havoc and destruction in Syria.